I'm posting a little early for White Wednesday. I have been saving these photos for this last Wednesday before Christmas. This is my sideboard that I moved into the entry hallway right before Thanksgiving. Ive had such a wonderful time decorating it for Christmas. So I didn't want to miss out on sharing it with you all. Lovey doves in a white sleigh. with a jingle bell wreath. that we found this year at a flea market. Thank you, Kathleen, at Faded Charm. Debra, you saved the best for last. Oh mylanta, how beautiful...everything! What a lovely way to enjoy the spirit of Christmas, with such peace and "white". The litho is magnificent and I don't know where you got the crown, but I love it! Merry Christmas from my home to yours. Hope it is everything wonderful...just like you! Wow! So heavenly... Love all of it, the crown, the statue, the birdcage, especially the wreath, the sweet tree with crystals. You look like you are ready for Christmas! I'd better go, my sideboard is looking a little bare... I just got some great ideas on what to put on it! Oh - GORGEOUS as ALWAYS!!! The lithograph is just breath-taking!!! Beautiful picture. Merry Christmas and Happy birthday Jesus. Debra, this is all so gorgeous!!! Love the statuary with the crown! I WANT that crown!! The jinglebell wreath! Want that too! Oh! And the feather tree!! LOVE IT!!! Beautiful!!! I am wishing you and yours a Merry Christmas!! So pretty. Love it all. LOVE the bells. I'm a sucker for the bells. The statue is lovely also. My mom in law would fall in love with it and be so expressive about it you would probably wrap it and send it out the door with her. Just her style. It is a great display Debra and I also want to thank you for stopping by and leaving such a melt your heart comment. Thank you for the prayers for our Lucas. Beautiful, Debra! Your feather tree is such a wonderful find. I love the jingle bell wreath on the birdcage! What a beautiful vignette, my friend. Merry Christmas to you and your family. I hope you have a wonderful holiday! It's all soooo PRETTY...Merry Christmas to you and your family! Beautiful white Christmas finery. I love the textures of your vignettes. Thank you for following my blog and for your kind note. So glad I stopped by, you have a lovely blog. Your home looks so festive, the nativity lithograph is a treasure. I'll be following along too. I wish you and your family a wonderful Christmas! Now THAT was a White Wednesday worth waiting for! I am in love with your wreath hung in ront of the birdcage, what a clever idea! The new page header is beautiful. I just this Madonna and the Christ Child. Just beautiful. What could be pretty then all the white and green. So pure and elegant. Just full of goodness. 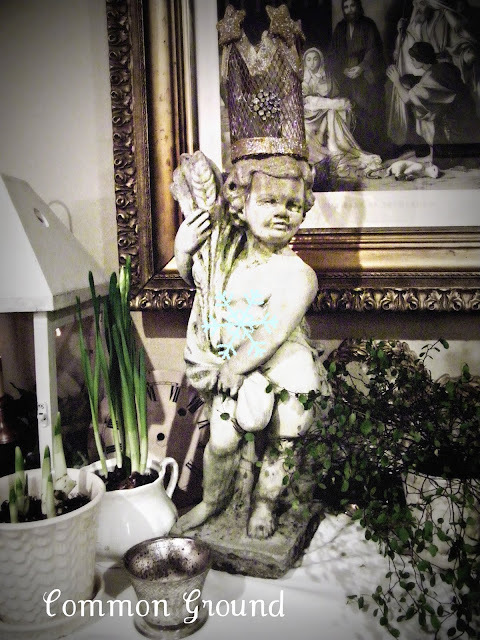 I love the statuary, you have so many treasures and amazing collections. I like the crown too...I know what those are really made for...I want a bunch to throw at HIS feet! What pretty whiteness and it looks so fresh and crisp too. Happy Christmas Debra and thanks for sharing such pretty photos all the time for us to drool over! It soooooooooo beautiful! Yummy and gorgeous and peaceful all at the same time! Thank you for sharing! debra i love it! ok! i love the bell wreath! did you make it? i love the crown! did you make it? i love the paperwhites! i need to learn how to grow those! and that framed nativity! i want it! beautiful! thanks for sharing!